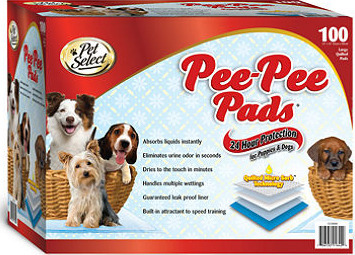 In my battle of the very best puppy training pads I bought from Walmart.com the Pet Select Pee Pee pads. They may be my favorite training pads of all. Why do I like them so much? Well for one, they are a heavier weight than all the other training pads I’ve tested.Therefore they don’t blow away if the air conditioner is on or when people and pets walk by them.The waffle weave of the pad is significantly more absorbent than other pads I’ve tried. The plastic underside is sturdy, and never leaks. I like how Pet Select Pee Pee pads are sent in a sturdy box for easy and tidy storage, and they are nicely folded. My puppy Charlie by now loves all training pads and uses at least 10 to 15 pads a day.So I appreciate that the 100 count box will last me about a week. The one down point for me is that it is a product not made in the USA. You can buy a 100 count box for only $29.97 at Walmart.com.